Cincinnati. Photos by Jeramey Jannene. The past ten years have seen an incredible rebirth of cities across the nation and Cincinnati is no exception. 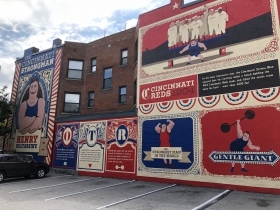 Dubbed the Queen City for its role in America’s westward expansion, the southern Ohio city has a booming downtown, a host of lively historic neighborhoods and a growing sense of pride. Steeped in a history of brewing and German heritage (sound familiar Milwaukeeans? 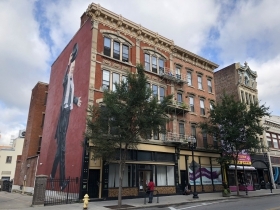 ), the urban heart of Cincinnati is one of the most walkable, affordable and welcoming places in the country. Founded in 1802, the city of approximately 300,000 has an approximately 50-year headstart on Milwaukee in terms of history. And it shows: a walking tour of the city is a constant collision of the historic and modern. I had the opportunity to spend three days in Cincinnati with my wife in late summer and found myself enjoying every minute of it. Whether you’re going to watch the Milwaukee Brewers play the Cincinnati Reds, partake in the largest Oktoberfest celebration in America, attend the massive Blink festival of art and light or check whether a city can actually be more German than Milwaukee, you’ll find a lot to love here. 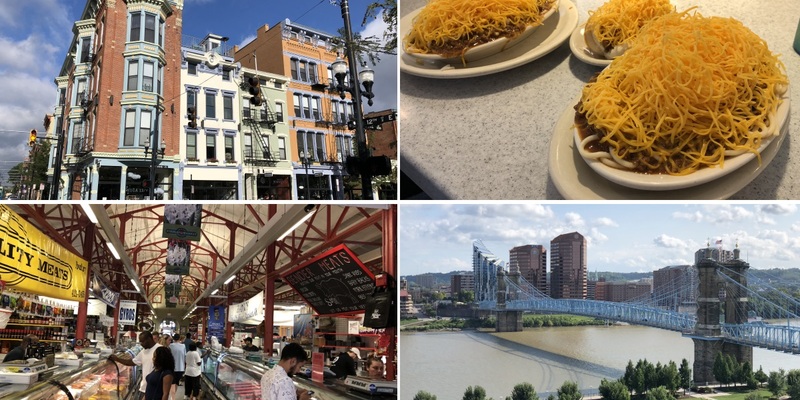 Cincinnati has a wealth of dining options, as you’d expect for a city once branded “Porkopolis.” Here are some of the most interesting choices, also chosen to match geographically with the “What To Do” section of recommendations. The place for breakfast in Cincinnati, or a late night drink. Now with three locations (The Banks, Over the Rhine and Clifton), the restaurant features waffles served seven different ways at any time of the day. 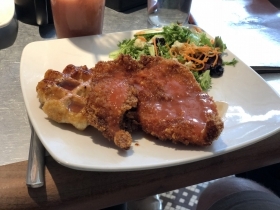 If that’s not enough, a host of different lunch and dinner entree options feature the restaurant’s trademark waffle. 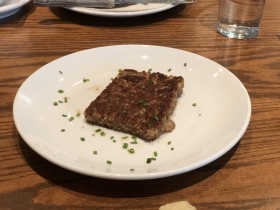 If waffles don’t appeal to you, the menu has plenty of other options, including goetta. The German-inspired meat-and-grain sausage is a Cincinnati staple you will hear a lot about and must sample before leaving town. The fast-casual chain’s reach extends far beyond Cincinnati at this point, but Skyline Chili is a Queen City staple. The restaurant, founded in 1949, serves up a unique blend of chili in a progressive way. A three-way is spaghetti noodles covered with chili and a mound of cheddar cheese. A four-way adds onions or beans. A five-way adds onions and beans. It’s one of the “when in Rome” experiences that everyone should do at least once. 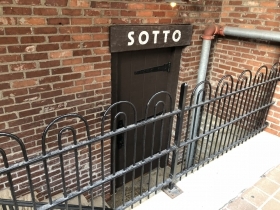 Easily the best meal we ate on our trip, Sotto also offered quite the experience. The basement restaurant, reservations highly recommended, features great service and a unique menu, all under candlelight. The good service comes in handy as the menu, heavy on authentic Italian fare, is a bit intimidating. Our waiter guided us through round after round of delicious, shared plates. 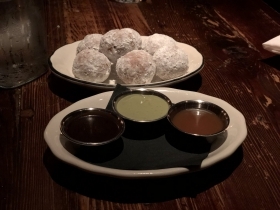 The experience culminated in splitting ricotta doughnuts, which is something I never knew I wanted, and now don’t think I could ever get enough of. Walking around Findlay Market (detailed below) is a paradox of choice. What could you possibly want when everything is available? 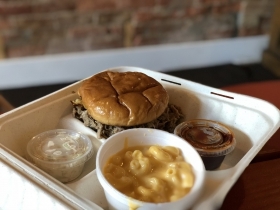 This small barbecue restaurant delivered in a big way. The prices are cheap, the ambiance welcoming and the food’s delicious. The pulled pork sandwich at $6.25 is highly recommended. We stopped at Senate tavern hoping to split a little snack. We knew the hot dogs were highly rated, and settled on the “Trailer Park” (beef hot dog, bacon, American cheese, coleslaw, crushed grippos, $11) from the seven dog menu. What arrived was easily more than a meal for the average person. Delicious, unique and filling. Owing to its German heritage, Cincinnati’s history is as steeped in beer and brewing as Milwaukee’s. The resurgence of craft brewing and trendy taverns has certainly reshaped Cincinnati just as it has Milwaukee. So don’t take this list as a comprehensive list. Like the Cream City, the Queen City has a list a mile long of corner taps, cocktail bars and off-the-beaten-path taverns worth stopping in. Here are some places to wet your whistle. In Milwaukee, you tell your friends to go to Lakefront Brewery. 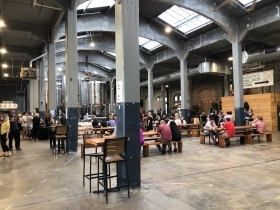 In Cincinnati, you go to Rhinegeist. 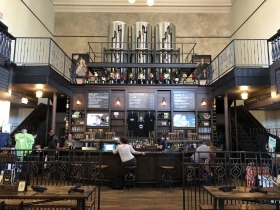 Founded in 2013, the brewery has embraced Cincinnati’s brewing history by locating a large structure built in 1895 for the Christin Morlein Brewery at the north end of the Over-the-Rhine neighborhood. Once you make your way to the third floor of the massive brewing complex, you’ll find one heck of a party. There are tours, there is a large beer hall, there is food, but most importantly, there is good beer. If the weather is right, keep climbing and head to the rooftop deck that offers incredible views of the city. 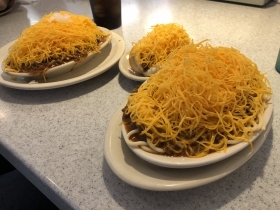 It’s a can’t miss stop on any Cincinnati visit. The Taft family has long been associated with Cincinnati, most prominently with President William Howard Taft. And while the Taft family doesn’t have any ownership interest in Taft’s Ale House, the place is decked in images of the former president and Supreme Court Chief Justice. The logo features a silhouette of the large Taft as urban legend depicts him, stuck in a bathtub. Thankfully, the bathtub isn’t used to make the beer. So stop in for a taste at the 1850 protestant church turned tap room. Kentucky, Cincinnati’s neighbor to the south. has no shortage of places to imbibe. Bourbon is Kentucky’s specialty and three area distilleries are included on the Kentucky Bourbon Trail. You can sample the product without going to the source by heading to any of the nine locations on the B-Line, a collection of bourbon-centric bars and restaurants just a short walk or ride from downtown Cincinnati. The idea of a video game bar isn’t as unique as it once was, but 16-Bit features a wide variety of games and an impressive array of themed cocktails. Drinks range from the extremely potent “Game Over” to the considerably more tame Slush Puppie. If 80’s and 90’s nostalgia is your thing, try a Macho Man (includes a Slim Jim), Pam Anderson or Winnie Cooper. Board game lovers, this is the place for you. This Over-the-Rhine bar is packed with all kinds of free games to play while you eat and drink, everything from tic-tac-toe and The Office trivia to Settlers of Catan and chess. Break out the dice and stay awhile. Stop in this bar with a view for a drink or two to take in the sunset and the Cincinnati skyline. 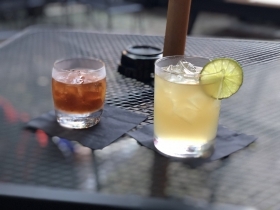 Located in the Mount Adams neighborhood, the bar takes perfect advantage of its location atop one of many of the steep hills surrounding the heart of Cincinnati. You can bus, bike or drive here, but if you’re wanting to earn that drink like I did, go for a walk. Picking a place to stay is always a balancing act between price, points and location. But let me suggest two hotels. The AC Hotel Cincinnati at The Banks, part of the Marriott family, is a new hotel (2017) located near all of the action on the waterfront and a stone’s throw from both professional sports stadiums. The hotel features a very modern interior that flows from the lobby to the rooms. A rooftop deck affords great views of the river, Kentucky and downtown. If you’re looking for a more historic and traditional hotel, try the Hilton Netherland Plaza. Built in 1931 as part of a city-within-a-city development similar to Rockefeller Plaza in New York City, the Netherland Plaza is designed in French Art Deco style. A substantial effort has been made to keep many of the hotel’s ballrooms in their original state, including the cruise-ship styled Pavilion Caprice room, originally a nightclub where a young Doris Day performed, the Hall of Mirrors ballroom and the Palm Court, now a bar and restaurant. Unfortunately, a restaurant with an ice rink that featured daily performances has been eliminated. While it’s since ceded the mantle, the Carew Tower was long the tallest building in Cincinnati. The Art Deco tower is connected at ground level to the Netherland Plaza hotel, but rises 49 stories above the street. It has none of the frills of modern observation decks, nor the expensive entry fee. Just $6 gets you an outdoor, unobstructed 360-degree view of the city. On a clear day, you can not only see Cincinnati, but Kentucky and Indiana. Recommended as one of the first things you do so you can get a lay of the land. 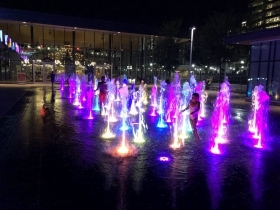 The Queen City has invested heavily in creating a central, public gathering place. 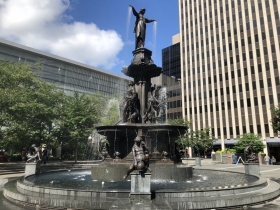 Fountain Square, named for the ornate, 43-foot-tall fountain located in the park since 1871, is bordered by shops, restaurants and hotels. But it’s what happens in the park that makes it special: economic development group 3CDC programs the park virtually every day of the week with concerts, games and movies. Over the Rhine, named for the German residents that once lived in the neighborhood and the canal they would cross to get into downtown, is one of the most pedestrian-friendly historic neighborhoods in the country. Lined with block after block of Italianate architecture, the storefronts are now home to restaurants, bars and many unique stores. 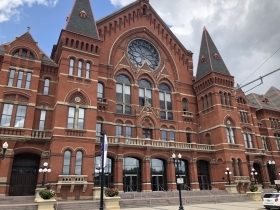 Budget a half day to explore the neighborhood on a walking tour that culminates with a stop at Findlay Market, Rhinegeist Brewery or the gorgeously restored Cincinnati Music Hall. 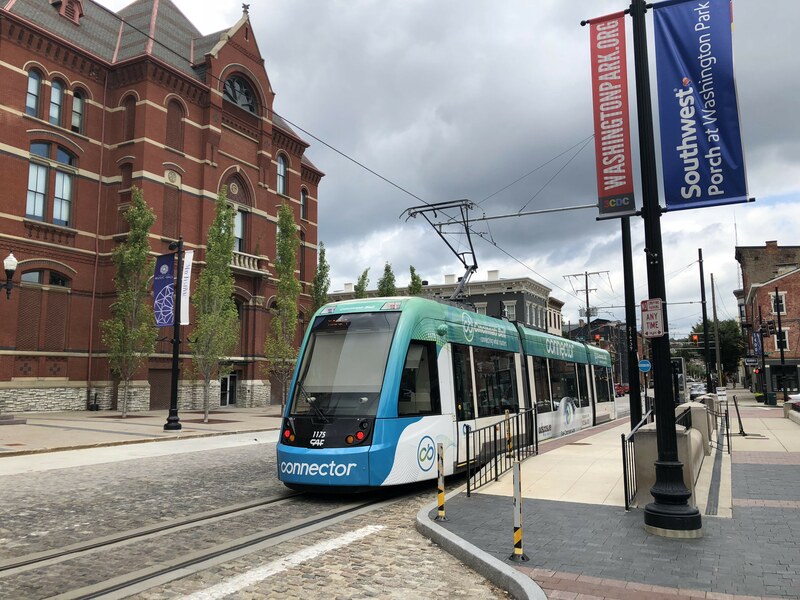 If you end up needing a boost, hop on the Cincinnati Bell Connector streetcar line to easily move from one end to the other. 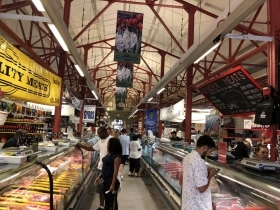 Cincinnati has one of the nation’s great public markets. 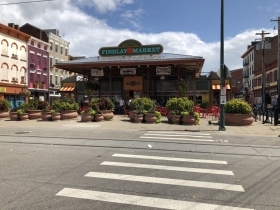 Pop into Findlay Market at the north end of Over the Rhine to grab a bagel, lunch or food for later. If you have any question about the authenticity of the place, note the melting pot of Cincinnatians from all walks of life here. The market has operated continously in the same structure since 1855. The action doesn’t stop here; the blocks around the market are lined with restaurants and stores. 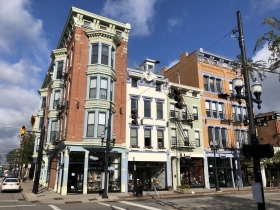 Downtown Cincinnati is bordered by one of the city’s oldest neighborhoods (Over the Rhine) and one of the newest, The Banks. The neighborhood, built along the shores of the Ohio River in the last 20 years, is anchored by stadiums for the Cincinnati Bengals and Cincinnati Reds. But what connects the two is an incredible riverfront park, complete with swings, pedestrian trails and lots of fountains. In addition to Smale Riverfront Park, and a stretch of bars and restaurants on E. Freedom Way., are two venues open year-round and worthy of your time. 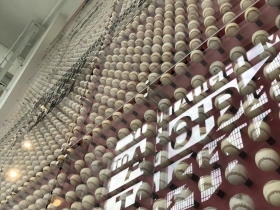 The Cincinnati Reds Hall of Fame is steeped in baseball history, including 4,256 balls representing each of Pete Rose‘s hits. More significantly, The Banks is home to the National Underground Railroad Freedom Center. Opened in 2004, it examines Cincinnati’s role in the Underground Railroad as it sat on the border of free and slave state, as well as a broader examination of all efforts to abolish human enslavement. No shortage of this. The Over the Rine neighborhood, in particular, is covered in high-quality murals. ArtWorks Cincinnati has created 132 murals throughout the city via a program that unites youth apprentices with professional artists. You can take a self-guided tour via a map on the organization’s website. My personal favorite is The Cincinnati Strong Man: Henry Holtgrewe, which combines great art with an easy-to-follow story. Located just across the river from downtown Cincinnati, Covington feels like part of Cincinnati, with a slight bourbon twist. You can get there with a short walk across the John A. Roebling Suspension Bridge, the predecessor to the more famous, but no more attractive Brooklyn Bridge. 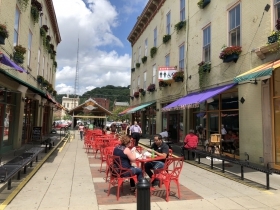 The narrow streets of downtown Covington are lined with shops, bars and restaurants that, unlike Cincinnati’s brewing history, are steeped in bourbon, be it production, consumption or even art. Located off the beaten path, the American Sign Museum takes you back in time. 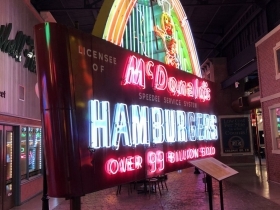 The 20,000-square-foot museum is adorned with over 100 years of sign history from Holiday Inn and McDonald’s to long-forgotten gas stations and beer brands. The signs, arranged by era, contain detailed explanations of their importance that was not only informative, but has changed at how I look at signs found around Milwaukee. The Cincinnati Bell Connector in Over the Rhine. Photo by Jeramey Jannene. If you’re staying in the heart of Cincinnati, there is no need to deal with the hassle of a car. A walk from the north end of Over the Rhine to the south end of The Banks along the Ohio River is less than two miles. You can easily extend your range with Red Bike, the local bike share system, or Bird’s dockless scooters. 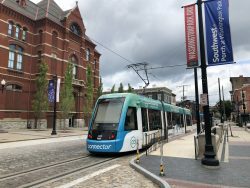 The city also has a new streetcar system, the Cincinnati Bell Connector, and bus system. 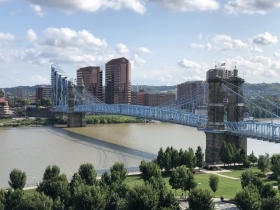 Walking or biking across the river to Kentucky is easy with protected lanes on many of the bridges, but if you want to ride there the Southbank Shuttle connects Covington and Cincinnati with frequent, affordable service. Service from the airport, located in Kentucky, to downtown Cincinnati is provided by The Airporter bus line for $2.00.